When you have your wireless network in place and your PC ready, you can easily make the wireless connection between the two. Microsoft recommends that your wireless base station or WAP broadcast the SSID, as long as you’re using WEP encryption in infrastructure mode. This approach makes everything easy and automatic, as long as you select an SSID of your own. Don’t use the default SSID, or else you’ll leave a security hole in your wireless network. With a broadcasted SSID, connecting is as easy as plugging your wireless network card into your laptop. 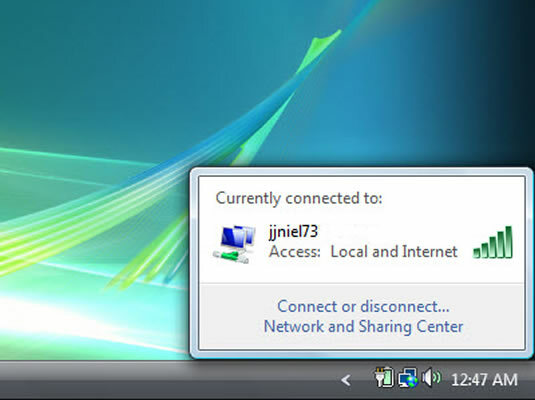 Both XP and Vista automatically search for and connect to your network. If you’re using a desktop PC with a wireless card, this same process occurs when you log in to Windows. You see on the taskbar a notification icon letting you know that the connection has been made, as well as how strong the signal is, as illustrated in this figure. The taskbar shows you when your PC makes a wireless connection.